4BR 2BA duplex located directly on the beach. Great fishing, golf, and sailing. 'Sandhaven' has 3 bedrooms upstairs with 2 single beds and 2 queen beds, with 1 bath and laundry room. Downstairs is 1 BR.with queen bed, kitchen, dining area, living area, bath, and den area. There is 2 sleeper sofas downstairs and a futon upstairs if needed. This is a non-smoking unit and no pets are allowed. No bonfires on the beach and no disturbing the sand dunes and sea oats and no fireworks. We rent Saturday to Saturday in summer and require a 50% deposit to hold a date. The full rent is due 60 days before date and I will send lockbox combination. Please send e-mail and I will send info sheet. I am a retired pharmacist and owned my own store.My wife is a retired elementary school teacher.We met at Samford University and have been married for over 50 yrs (1966).We have 2 daughters and 6 grandchildren.We live in Cullman,Al which is about 300 miles from our beach house.We enjoy our time there and hope you all do also. We had an awesome vacation. My daughter and 2 year old grandson and daughter and 4 of her friends that just graduated high schools do myself stayed for week. Weather was perfect. We saw dolphins everyday. Stingrays sharks soft shell crabs. The only negative I can say is there were not enough towels provided for a house that sleeps 12. And was not impressed with their cleaning service. Had to wash sheets before use is downstairs bedroom. And had to clean downstairs bathroom. It appeared someone had stayed and place had not been cleaned. Great access to beach. Would definitely stay again!!! Would recommend this to anyone looking for great spot on quiet beach. My family came from far and wide to Ft. Morgan. Houston, Tx, Memphis, Tn and Madison, Ms. We just went online and liked what we saw and read the great reviews. The beach was beautiful. The picturesonline do not do the home justice. There is an additional living area with big leather couches and a large tv. The kitchen had everything we needed to cook meals. Our entire family of 12 included ages 4-82. We enjoyed a exciting dolphin trip in Gulf Shores and saw many dolphins. We all had a blast. Several visited the Foley outlet mall. The kids loved the airshow in Pensacola. We ate at several recommended places and were impressed with the food. 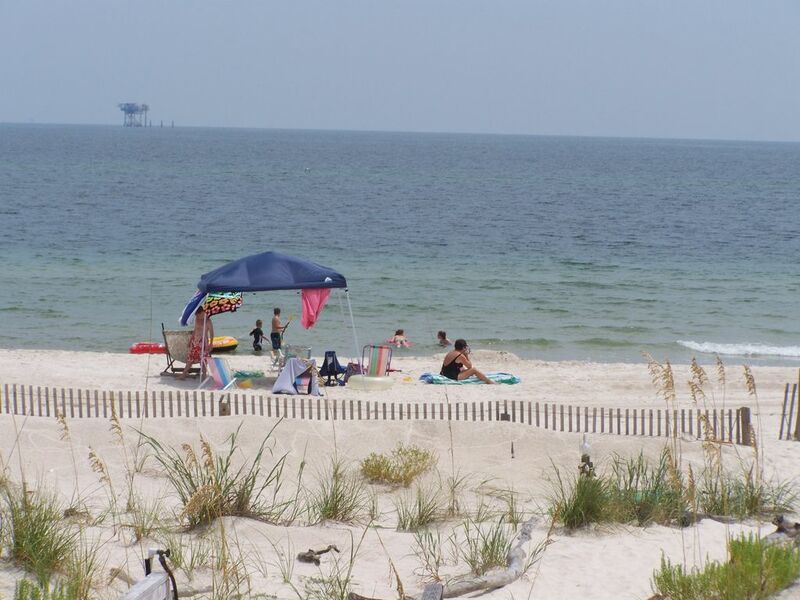 The area of Fort Morgan is quiet and very family friendly. I would recommend this home to anyone who wants beach fun and quiet. Lavern the owner provided details of the items we needed to bring. If we ever go back to the area, I will choose the same home. We rented both sides of Sand Haven July 26th - Aug 2nd. 14 Adults and 6 kids and had a blast. The accommodations were Great! The house was just as the website promised, the fishing from the beach was very bountiful. The only drawback about the beach were the jellyfish which were quite active and quite painful at times. The ocean waves were worth the stings tho...the waves were fun. We are looking forward to booking Sand Haven again for next summer. BEST BARGIN ON THE BEACH!!!! My Friends and Family rented both sides of the duplex last year and we had a blast. The home is even better than the site discribes and the price is the best I have found anywhere. We loved this home so much that everyone who went last year, including a few more friends, are going back this year! You can't go wrong with this rental, the owners of both sides are wonderful people and very honest. Everything was just like they described, if not better. I took my children/ grandchildren on vacation, this was a excellent choice of place to stay. The house was great, the view was wonderful, we saw lots of sea life every day. The beach / sand was wonderful. Clean surroundings. Stingray's were playful, Dolphins appeared in the mornings, the neighbors were great. The home was perfect. Everything we needed was there. Couldn't have asked for anything more. I took over 800 pictures of kids on the beach to remember this by. I will be going back to this home again. Thanks so much for your quick responses to my emails, etc. We stayed here the week of May 21-28, 2005. The house was great! We really enjoyed our time here and the weather was perfect - not a single drop of rain the whole week. We stayed on the beach from sun up to sun down! Thanks for the great time! We will definitely be renting this house again!